The AcerED273 offers a 27-inch screen with 1080p visuals at 144Hz refresh speeds for maximized gaming and entertainment performance without costing a lot. The product comes equipped with a curved VA panel for an immersive experience and more profound vibrancy and contrast levels which are excellent for gaming. The Acer ED273 is an indication of the display market’s maturity by considering 144Hz as a standard spec which in turn, makes ownership easier and affordable. 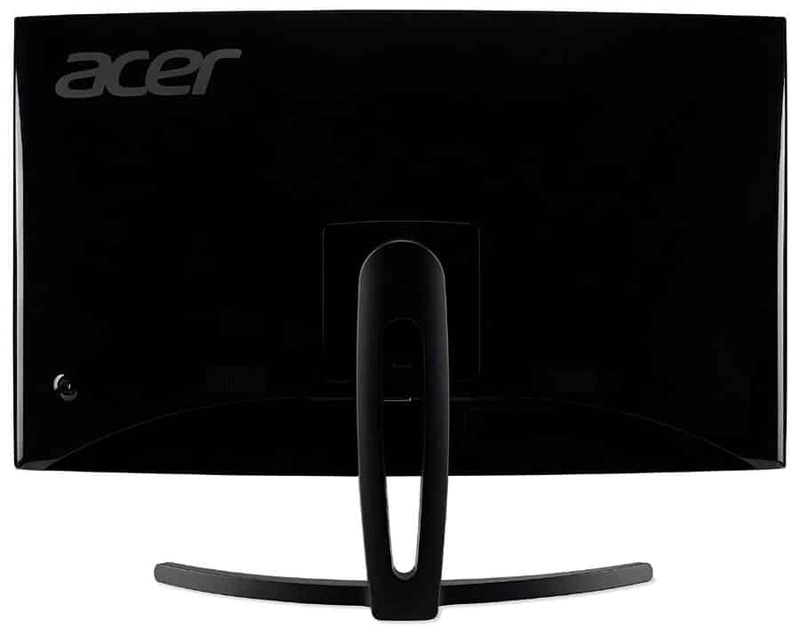 The Acer ED273 could be easily mistaken for a vanilla monitor if it did not adopt a slightly aggressive 1800r curvature. This model comes in comes in either white and silver (wmidx) or black (Abidpx), but the latter is more interesting due to its gaming features. The face is bezel-free save for panel borders outlined with a thin plastic layer on the sides, offering unobstructed viewing for its users. The product and its proportions are clean and reasonable, although we think that maintaining its glossy black exterior from dust and scratches could be somewhat tricky. The Acer ED273’s depth shouldn’t take up a lot of depth on your desk since the whole product including its stand only eats up 6.6 inches. The curve and its low price make this gaming monitor a suitable candidate for triple monitor setups. Although the shortcuts Acer had to make to meet the price point are immediately noticeable with a single glance on the Acer ED273. The device only offers tilt, so some users might prefer mounts or monitor stands for a bit of anthropometric freedom. Thankfully, this part can be removed in favor of VESA mounts with 100 x 100 bolt patterns. There isn’t plenty of connectivity options on the Acer ED273, but its layout should provide enough coverage for your PC and other gaming devices. The I/O includes DisplayPort 1.2, HDMI 1.4, and DVI for video inputs plus a 3.5mm jack which complements the 3-watt built-in speakers. The pair pumps sound out from perforations on the rear in a horizontal position to maximize its effect when placed against a wall. Users get to enjoy smooth OSD navigation thanks to a multidirectional joystick similar to what the Samsung C32HG70 has on its back. This feature is located on the lower corner of the back panel, accessible from the right-hand side when facing the Acer ED273. 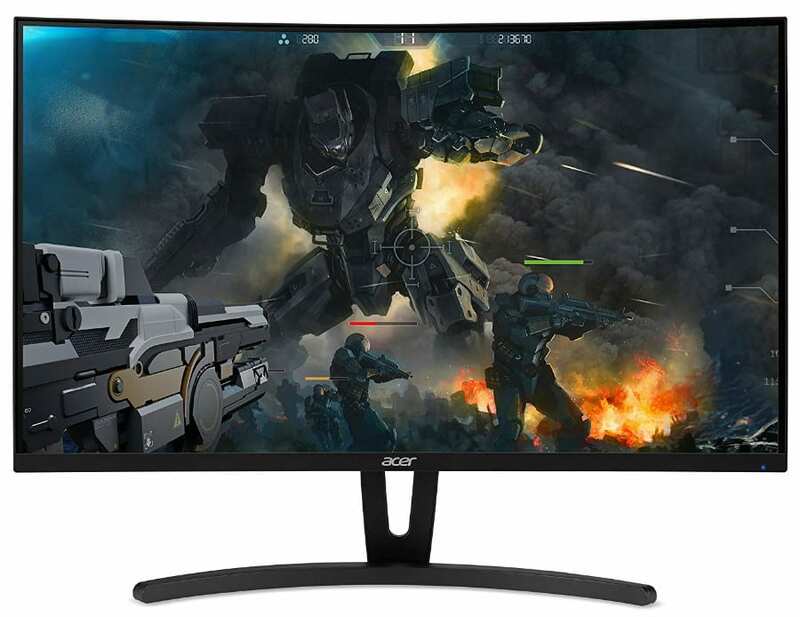 The Acer ED273 features a 27-inch curved VA panel with a 1920 x 1080 resolution, 144Hz refresh rate, and 4ms response time. Take note that the white and silver version (wmidx) only has 60Hz, so try to avoid the sway of the color scheme if you want gaming chops. The screen will come with a matte AG treatment for maximum glare reduction, although it isn’t refined, the screen could be grainy due to the low pixel density. The screen on the Acer ED273 will only have 81PPI, which could result in smudginess in text or object edges could become jagged. These reasons are why larger models with 1080p resolutions turn off a lot of buyers, although, for most gaming purposes, we think the combination still works. On a positive note, opponent’s heads or hidden objectives should render larger than a typical screen, adding a discrete edge for competitive gamers. The Acer ED273 does not impress in image quality when scrutinized with a DataColor Spyder Colorimeter. We expect VA panels to produce extended color gamuts or extra saturation, but this model is only capable of 98% sRGB. This score isn’t abysmal since average accuracy is at Delta E 2.15, but we expected more vibrancy from a VA monitor. Even if the WLED backlight isn’t as bright as specified at 230cd/m2, the contrast at least reaches a healthy 1600:1 at 50% brightness. This level misses the expected 3000:1 ratio, but the screen already provides rich blacks and excellent visibility in low-light scenarios. One cause we see is that the Acer ED273’s Gamma only hits around 2.0 and the slightly limited gamut volume. This gives the screen a somewhat watery image when sat next to a more capable display like the Samsung C32HG70. However, that’s almost an apples to oranges comparison since this product is only half the latter’s price. We also noticed a bit of backlight bleeding along the top corners of our Acer ED273 sample. This flaw is common with curved panels but manifests less frequently on VA or TN-based models. Take note that this aspect varies from unit to unit, so the lottery rule applies. In totality, the flaws mentioned above can be considered minor due to the Acer ED273’s low-end price bracketing. What highlights its capabilities is the 144Hz refresh rate which you can enjoy with FreeSync if you have an AMD GPU. The range is a bit narrower at 48Hz to 144Hz, but you can also get the tech to work with HDMI with a lower 48Hz to a 120Hz threshold. Input lag is also reasonably low at 14ms, making the Acer ED273 ideal for casual and competitive gaming. There are faster monitors in the market, but they cost considerably more and are not worth the extra premium if budget is limited. Another selling point is that you can use this offering with an Xbox One console that is updated to include FreeSync compatibility. The Acer ED273 has considerable flaws in the image quality department, but it presents tremendous value for the budget-conscious. The monitor is suitable for both casual and competitive gaming despite these compromises which are easy to ignore because of the price. You’d be hard-pressed to find a comparable model that offers similar, if not better capabilities for around $220. The Acer ED273 did not get a grand introduction like its high-end cousins such as the Acer Predator X27 which is delayed for 2018, but this model is now widely available. If you are interested in a wallet-friendly monitor that will instantly upgrade your gaming with a 144Hz screen, this model is definitely worthy of consideration. Acer ED273A offers exceptional value for money. It is more than what you expected on a curved gaming monitor with high refresh rates and fantastic image quality. For me, it is one of the best choices. Thank you for sharing your valuable feedback Alice! Wow, it seems the VA panel monitors are really growing steadily. I think it is because of VA panels having the ability to provide a high static high contrast compared to other panel types. The only thing that VA panels need to improve is the pixel response time. Hopefully that won’t be an issue anytime soon. And I hope someday there will be a monitor that could be budget friendly and able to provide the same capabilities as a CRT except without the power hungry and high manufacturing cost drawback. Hello Neptuniafan! Some VA panels have dramatically improved in this regard, however, the industry has yet to release an LCD display with the capabilities you mentioned. Let’s cross our fingers that when it does come out, it would be priced fairly and accessible to everyone.